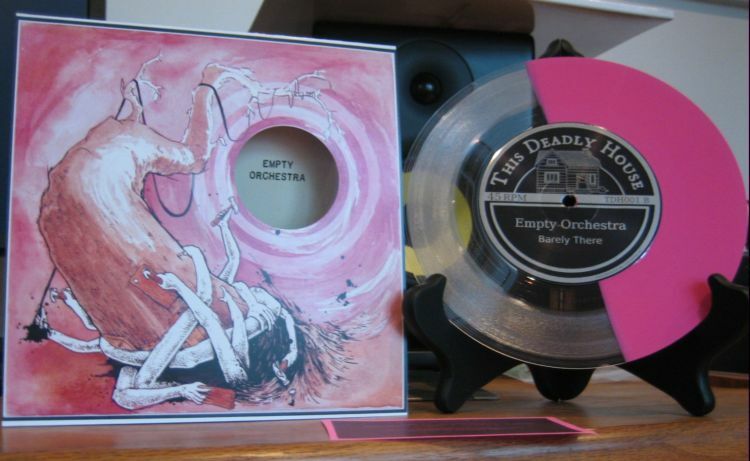 Empty Orchestra – Crooked Limbs 7″ Available Now! Empty Orchestra played their 7″ release show last night to a packed house at the Lunch Studio in Flint. If you weren’t able to make it to the show and pick up their hot new slab of wax in person, you can order it now through the TDH webstore. The release is available on marble green and opaque pink / clear vinyl and features a 6-panel, die-cut insert with artwork by Dave Kloc. The record also comes with a digital download card. Get one quick because these won’t be around for long. Physical copies of the record are currently on sale at UHF in Royal Oak and Reckless Records’ Broadway location in Chicago. More locations to be posted soon. This entry was posted in Uncategorized and tagged empty orchestra, sweet sweet vinyl by thisdeadlyhouse. Bookmark the permalink.